Government of India Ministry of Urban Development DIRECTORATE OF ESTATES Nirman Bhawan, New Delhi-110 108 No. 12035/28/96-Pol.II(Vol.II) APRIL 25, 2013 OFFICE MEMORANDUM Subject: Amendment in Supplementary Rule 317-13-11 of Allotment of Government Residences (General Pool in Delhi), Rules, 1963 regarding retention of Government accommodation on retirement —Date of applicability regarding The undersigned is directed to forward herewith a copy of Gazette of India (Extraordinary) Part II, Section-3, Sub-Section (i) dated 23.4.2013, notifying the Directorate of Estates' Notification of even number dated 10.4.2013 on the subject mentioned above for information and further necessary action. 2.The amendment notified vide the aforesaid Gazette shall be applicable to all the allottees of General Pool Residential Accommodation retiring on or after 23.4.2013. Government of India Ministry of Finance Department of Expenditure North Block, New Delhi, Dated: 25th April, 2013. The undersigned is directed to refer to this Ministry's Office Memorandum No. 1(8)/2012-E-II (B) dated 28th September, 2012 on the subject mentioned above and to say that the President is pleased to decide that the Dearness Allowance payable to Central Government employees shall be enhanced from the existing rate of 72% to 80% with effect from 1st Jan, 2013. Introduction of online reservation system in the reservation/allotment of casual hostel accommodation in the Central Government Touring Officer's Hostel/Holiday Home/Guest House at Delhi. Subject: Introduction of online reservation system in the reservation/allotment of casual hostel accommodation in the Central Government Touring Officer's Hostel/Holiday Home/Guest House at Delhi. With a view to provide for choices & convenience of the applicants for reservation of casual hostel accommodation in the Central Government Touring Officer's Hostel/Holiday Home/Guest House at Delhi, it has been decided to introduce automated online reservation/allotment system w.e.f. 01/05/2013. 1. Short Title & Commencement: (1) These rules may be called the Allotment of Government Residences (General Pool in Delhi) Amendment Rules 2013. (2) They shall come into force from the date of their publication in the official Gazette. New Delhi: The Union Cabinet on Thursday approved a proposal to increase dearness allowance (DA) by 8 percent to 80 percent from existing 72 percent. The move will benefit about 50 lakh employees and 30 lakh pensioners of the central government. The hike would be effective from January 1, 2013 and the employees and pensioners would be entitled for arrears. Decision on hiking DA was deferred on April 2 as the Finance Minister was not present. The government had hiked DA to 72 percent in September last year, which had come into effect from July 1, 2012. As per the practice, the DA is merged with basic pay when it breaches the 50 percent cap. This helps employees get higher allowances as those are paid as proportion of the basic pay. Dearness Allowance from Jan-2013: Cabinet may take decision in today meeting. NEW DELHI: The Union Cabinet is likely to approve a proposal to increase dearness allowance (DA) of central government employees by 8% on Thursday. The government had raised DA to 72% in September last year, which had come into effect from July 1, 2012. As per usual practice, DA is merged with basic pay when it breaches the 50% cap. This helps employees get higher allowances as those are paid as proportion of the basic pay. Confederation of Central Government Employees starts the protest against unanimous delay in grant of enhanced DA from Jan, 2013. Confederation writes to all Union to hold protest as lunch hour demonstration on 23rd April, 2013 & urged to send the telegram to PM of India. Confederation has also sent a letter to PM on today in this regard. This time our Finance Minister is on tour for this week and announcement of DA may be delayed. Sub:- Encashment of leave on availing LTC by family.Copies of MoD (Fin) ID No. 9 (2)/QA198 dated 20/03/2012 and DOPT I.D No. 14028/2/2013-Estt. (L) dated 25th Feb'2013 regarding clarification on encashment of leave alongwith LTC is enclosed for information, guidance and necessary action please. Subject: Declaration of Holiday on 14th. April, 2013- Birthday of Dr. B.R. Ambedkar. By Com K.K.N. Kutty Secretary General.Confederation of CGEs and workers. 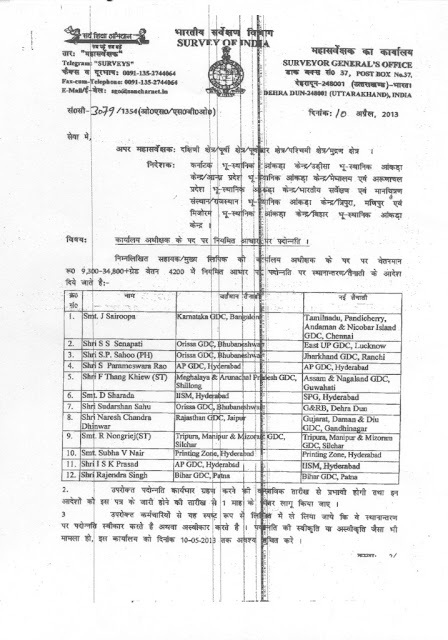 Corrigendum: Transfer Policy 2012 for Group “A” Officers of Survey of India – reg. 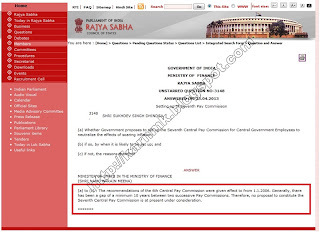 Subject: Transfer Policy 2012 for Group “A” Officers of Survey of India – reg. 6.2 (d) No officer should serve in any particular station, whether in a single posting or different postings, at the level of Director and above, for a total period of more than 10 years. 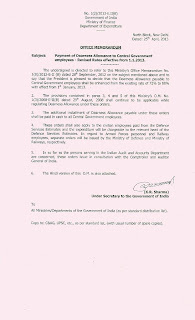 6.2 (e) No Officer should remain in a particular station continuously for more than 5 years. Sub:-Immediate Implementation from back date / due date i.e. retrospective effect of the quite unnecessarily long pending CADRE RESTRUCTURING . Ref:-Correspondence resting with your letter No. SM/11/03/2011 dt. 23-11-2012 since received by me on 08-12-2012 in reply to my letter for you vide No. J-MSA/Svy./29/2012 dt. 06/08-11-2012. Removal of Sri Balaji Action Medical Institute, FC-34, A-4, Paschim Vihar, New Delhi-110063 regarding. Subject: Removal of Sri Balaji Action Medical Institute, FC-34, A-4, Paschim Vihar, New Delhi-110063 regarding. Ad-hoc Appointment/Promotion - Review of - Regarding. North Block, New Delhi Dated the 2nd April, 2013 Office Memorandum Subject: Allowances and Special Facilities to Civilian Employees of the Central Government serving in the States of the North Eastern Region (including Sikkim) and in the Union Territories of Andaman & Nicobar, Lakshadweep group of Islands Extension of the benefits related to Travelling Allowance to Civilian Employees posted in Ladakh region of the State of Jammu & Kashmir- Implementation of the recommendations of the Sixth Central Pay Commission- reg. Govt. defers decision on hiking dearness allowance: ANI New Delhi, Apr. 2 (ANI): The Congress-led UPA Government today deferred a decision on hiking dearness allowance (DA) of central government employees to 80 percent from 72 percent at present.